German Import-After the success with their ‘Monoton EP’, Orange Sector return with the 2nd part of their trilogy. Another real EBM smash! Hard hitting electronic beats with the outstanding vocals by singer Martin Bodewell. 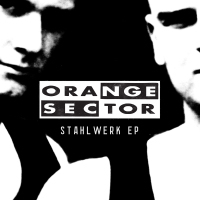 „Stahlwerk EP“ is a true must have for all EBM addicts. The physical CD is again strictly limited and will be sold out fast! ‘Im Stahlwerk’, ‘Terroristen’, ‘Der Clown und das kleine Mädchen’ or ‘Tanz in den Frieden’ are true Orange Sector hymns! The 8 song EP features outstanding remix versions by Martin Bodewell and NORDARR as well as a pulsating ‘Clubstahl mix’ of ‘Im Stahlwerk’ and an uptempo version of ‘Der Clown…’. EBM as EBM can be!